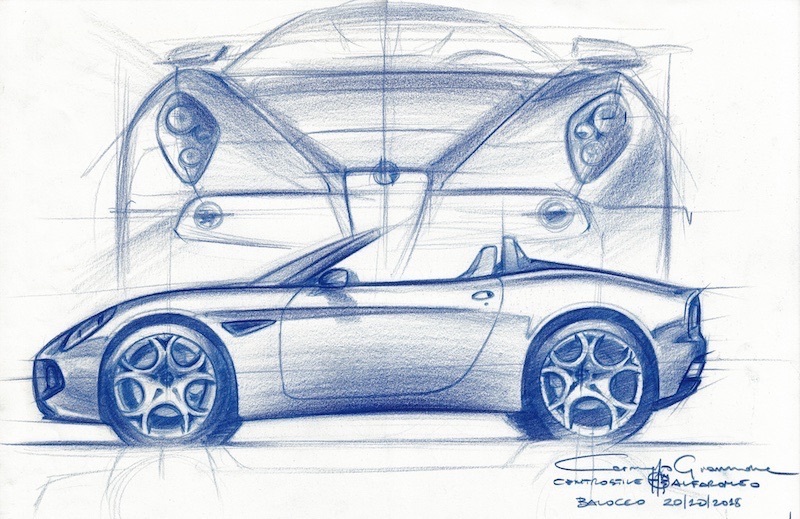 one of the sketches for the Stelvio. MacGeek, Rossorichie, jparkin486 and 4 others like this. A really nice gift delivered to me today by a friend who's friends with the Stelvio designer. Signed sketches with congratulations! I must get them framed. matty74, MacGeek, Tilum and 1 others like this. Did you drive a Stelvio? It's not equivalent to the Ewok. It's way better. Styling is a matter of taste but the LandRover is a Raleigh Chopper SUV on a Mondeo floorpan and no exotic materials or engineering. No I haven't driven a Stelvio. I was referring to your original post and the designs for an SUV. Most women who buy these cars aren't interested in the driving experience just what they look like hence why Evoque will sell more than the Stelvio. Don't get me wrong, I wish it was less subjective. Having lived in Australia the only Utility vehicle you would trust your life in the Bush with is a Toyota Land Cruiser with extra fuel tanks ,winch, CB radio and pneumatic pump non of which will be in a Stelvio or Evoque. I remember when the Ewoque was launched and an aspirational neighbour really wanted one. She seemed to like the fact it was a Range Rover rather than a mere Land Rover. My wife was saying a couple of weeks about neighbours around the next road she'd passed on her way to the gym. They had recently upgraded to a new RR Evoque and were describing the fact it didn't work , to an RAC man. Style over substance. Anyway , I thought it was nice to be given an original sketch of the Alfa I recently bought, by the designer. It certainly is I trust you will enjoy it. @cue2 I've got electronic copies of the lots of the sketches, but no originals... you lucky thing. As for the post about the Stelvio looking boring... The Stelvio Qf seems to get plenty of looks and thumbs up from passers by! I'm quite shocked if the first sketch was done on one of those A4 Pukka Pads from whsmith, the second one looks nice. I suppose the fact that the guy who drew it drives a Fiat Barchetta is a shock too?! Sketches from early on in the design process aren’t going to be polished works of art. The fact it’s drawn on pad paper only makes it feel more special, I think. Great things to have, those drawings. Not something I’d have come across otherwise, helps me appreciate the design a little more. cue2 and Zoo like this. It's not a sketch made during the design process. It's a sketch made for @cue2 . cue2 and SteveeGee like this. I was talking with my friend about driving over this summer ,with my Pinarello in the Stelvio, to cycle the Stelvio Pass and meeting up him and Carmelo on the way past Turin. SE11 is where you go with a Vauxhall. And bicycles have progressed since you just pushed them! I’m looking forward to seeing my 12 year flying up some hills on his new bike this weekend!